Lapeyre's steel bolted stair Models 01/02 provide a cost­-effective stair system for industrial applications. These models can be quickly and easily assembled at industrial job sites without certified welders or expensive installation equipment. Steel bolted stairs for commercial applications are also available. Compliant with BOCA, OSHA, NFPA, SBCCI, and UBC Industrial. Top/Bottom extensions meet BOCA and OSHA requirements. Press punched rail and baluster ends. Capable of withstanding 200 pound load applied in any direction. Rails and balusters constructed from 1½" OD tube. Balusters attach using provided bolts/spacers. Baluster spacing adjustable within specified code. Stairs may be purchased without one or both rails for applications that have their own wall rail system. Available in 24", 30", 36", 48" widths. Diamond plate and concrete pan tread are also available in custom widths. Diamond plate tread provides a solid tread surface with raised diamonds for a non-skid effect. Grip tread is Lapeyre Stair's most aggressive non-skid option. Concrete pan tread has wrap-around front diamond tread plate nosing and arrives ready for site-poured concrete. Bar grate tread has a serrated grating to provide a skid-resistand surface with a diamond plate nosing. Stringers are constructed of either 10' or 12' steel channel, depending on height/angle. STAIR HEIGHT (OSHA) 18" 240"
STAIR RAIL HEIGHT 30" 43"
BALUSTER SPACING (SPHERICAL CLEARANCE) 3.75" 36"
TREAD WIDTH (INSIDE STAIR WIDTH) 24" 48"
*Minimum/maximum requirements may vary based on code. Optional. 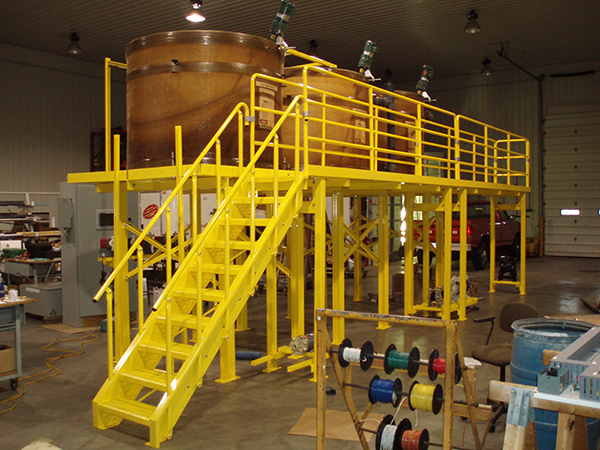 Steel bolted stairs come with standard cross bracing to connect the two stringers behind the treads. Standard cross bracing can be replaced with an optional set of back-pans to prevent objects from falling beneath the stairs.